This world is filled with business models of various types of which an average layman is exposed to the only fraction of business firms because of their advertising power and the hold that they have on the market. But many do not recognise that the economy of their country is not only dependent on this big player which make up a great amount of their GDP, it is also about those small and often forgotten about enterprises that make up the most of the chunk in the business world. These small sized enterprises are known as Small and Medium Enterprises or SME in business or Small and Medium-sized Business or SMB depending on whether you are in Europe or in America respectively. Let us find out what does SME stands for, how they are defined by the different government organisations, and what implication do they hold for us and for the country as a whole and most importantly why should you prefer to work for an SME rather than big corporates. SME is defined as those businesses where either the count of the member is below a certain level, as defined by the government or their total turnover is below certain limit again as defined by the government. In certain cases, a business can also be labelled as SME if they have balance sheet below a certain limit. Many countries have laid down certain rules, regulations, and acts which properly helps them to define a business as SME. This helps them to classify different organisation under suitable category and provide them with grants and funds to help SMEs achieve their goals efficiently. Different countries have different rules and codes for SME and thus follow them with efficiency. Although this rule is not necessarily same throughout the countries of the European Union but more or less they are around that figure. The reason for the variation can be attributed to the fact that few countries provide business subsidy and other funds to this enterprise. A microenterprise when the total expenditure costs less than Rs.30,00,000/. A small enterprise when the total expenditure costs less than few crores of rupees. A medium enterprise when the total costs less than several crores of rupees’, the actual amount can vary depending on the type of enterprise. A microenterprise is formed when the total expenditure is less than few lakhs of rupees. A small enterprise is formed when the total expenditure is formed between few lakhs and crores. A medium enterprise is formed when the total expenditures turn out to be within few crores. Similarly, in Bangladesh, MSME is divided in terms of the sector, a number of employees and turnover. In the United States the small business association categories the institution according to the sector type, ownership type, the number of workforces, turnover and other factors as stated by the Association. In Egypt, most of the people work in SME and a significant amount of GDP comes from these SMEs. And the list goes on. So many things come under this enterprise or sector. SME forms a core part in many parts of the country as they serve the major and best work of providing employment to most of its citizen. Also, this MSME serves to foster the economy of the countries by developing the rural areas, providing job opportunity, and localising the production or manufacturing of a product or providing cheap and easily accessible services to the people. SME business also helps in making a country independent of the foreign market and provides necessary technologies and resources to make a country self-sufficient. Since they are focused in only one sector and are not loaded with too many restraints, the SME acts as a centre for Innovation and breath-taking achievements that permanently changes the facets of that field. 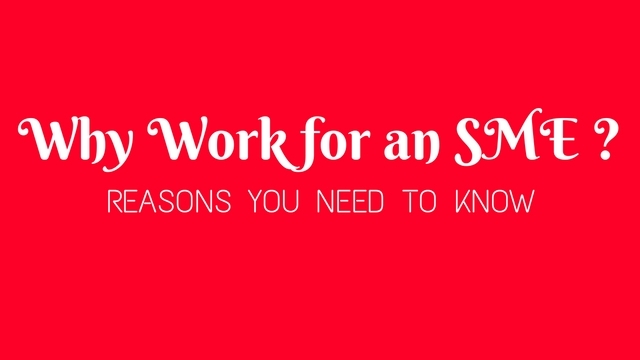 Why Should You Work an SME in Business? Most of the SME are benefited with government funded plans and special schemes that help them to develop faster and make it easy to go through the official hurdles which reduce the overdue time in other unnecessary works. Also, the government provides them with tools and schemes to foster its research and manufacturing process and make sure that they go through steady stages of building an indigenous and good business model for the long-term project. After reading all this we are now clear about the concept of the SME and how they are useful for our economy on a large scale and for us at a personal level. In comparison to other big corporate especially MNCs, one must have doubt as to why he or she should search for the job in SME. With such a small scale business model and at infant stage it is not easy for the person to take a decision to work in an SME. SME provides you with the best chance to work around in the office in your own way. It gives you with the opportunity to create your own path to success. Although, you might not be provided with best resources and technologies but is quite certain that with few people handling the operation of the company, you will be much more flexible in your way to run your business, execute your job and achieve yours and your company’s goal. This ultimately leads to self-driven goals which bring us to our next point in this context. Self-driven employees are the best employees that the company can ever have. Since MSME are at grassroot level, many employees are expected to work on various matters which may not be related to their specialisation. This can create a greater sense of responsibility among the employees. It is because of this that SME can really be your kind of thing if you are that type of person who enjoys working on those project where you can get to see your action into execution and really get to check the direct impact of your work on the project. You can really influence the project as a whole. As stated in above point, with fewer employees working in the enterprise it is evident that a single person will have to work in inter-disciplinary field and will also need to work in a team consisting of people who are from different background, on the project which is generally not familiar or similar to your field of work. This gives you the golden opportunity to expand your knowledge span and valuable assets to your arsenal of skills. It also helps to broaden your horizon and get a bigger picture of as to how a company functions in this complicated system of economy and politics. Unlike big companies where your work gets limited by the number of projects and you are limited in your option due to the hierarchy in the system, SME can really be a grand opening to your life, providing you with the offer to explore your place of interest and getting some breakthrough achievement that may change the industrial standards forever. Unlike MNCs you may not be able to get all the resources and technologies that are necessary for a successful innovation, you will get essential things required to initiate your dream project. In a traditional company, you interact with only your colleagues and with your next immediate senior. But in an SME you get to interact lots of time with the head of the company itself. Since each one is interlinked in some form or the other, everyone remains in contact with each other and answerable to every member and this creates an environment of healthy working culture and a sense of belongingness in the company. You can get to see your action impacting the project on a direct basis and thus make you feel more worthy of yourself. With long chains of power and hierarchy in the workplace in many workers are chained to the will of their bosses and it becomes really difficult to check on the ground reality for every worker. Many employees fall prey to the office politics and as a result, they fail to get the satisfaction in their work. Whereas in SME the number of workers are less, so the chances of work politics drastically decrease. Also, as everyone knows every other chances of such events really decrease which fosters a sustainable, happy and satisfactory working condition. SME industries have lesser number of employees than any other bigger enterprise. No other organization can give you that type of opportunity to work at the grassroot level as SME companies can provide you with. SME, being on a small scale, has its market limited to local buyers. i.e. most of its services are used by the local users. As an employee of SME, you can get the chance to manufacture a product or provide services that have a real impact on the lives of the local people and help to develop the local economy and also help to foster the local social and cultural condition. So not only you get the attention that is required but also a mindset to change everything from a very low level. With small sized companies, the chances of following many unnecessary official runs and paperwork significantly decreases. With abrupt working style, you get the chance to choose your own way to work and take advantage of your government policies that help SME to develop a quick prototype and start the faster realisation of products or services. In an MNC you may be tied down with so many formalities that it becomes very difficult for any new ideas to sprout. But with Small Medium Enterprise, you do not have to face such difficult times. So you can fit yourself into any working condition easily. Working for a small company or large company ultimately adds to your country’s GDP but with the small company, you get the chance to carry out those works which improves the lifestyle of the local people. You may also be able to develop something of great importance that can advance your country in terms of technology or resource. So working in an SME can really be fruitful if you can really come up with a revolutionary idea that is not only realistic but is within the framework of the economic structure of the company. SME are a really exemplary form of business model that serves an important role for the country’s all round development. With modern technologies bringing the disruptive model of business, it is not far away when the SMEs will become the new MNCs. It comes with its own set of problem which can make it difficult for people to work in SME like lack of structure, technological backwardness and lack of resources but with government aid and with advancement in cheaper and affordable technologies, the SME are getting capable of delivering some groundbreaking result in the near future and they will continue to form a great portion of our country.